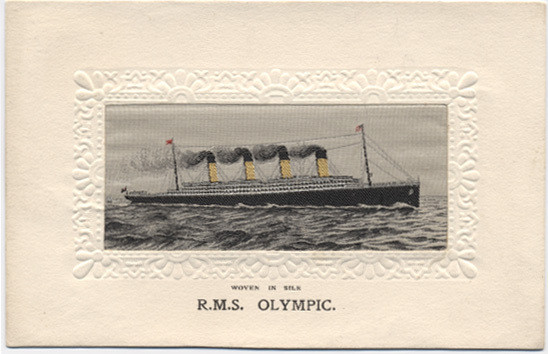 We are very grateful to John for another blog post contextualising the ocean liner ephemera which he is donating to the John Johnson Collection. In the very early 1900s postcards were an inexpensive form of communication, travelling at a postal rate costing less than letters. However, if you wanted to display a special level of love and friendship you could pay the money to purchase a woven silk postcard. Woven silk images were reportedly first introduced in the 1860s using Jacquard looms which had become redundant in the face of imported competition in ribbon manufacturing. Thomas Stevens was the innovator and he was able to adapt the looms to create pictures in silk. Bookmarks, greeting cards, and eventually postcards were among the upmarket products coming out of the mills in Coventry. Because of the leadership of Thomas Stevens, they became known as Stevengraphs. The Sayers Collection illustrates two different styles of Stevengraph ship postcards. One is a colour image of the ship with the name of the ship and sometimes other information printed below the image. 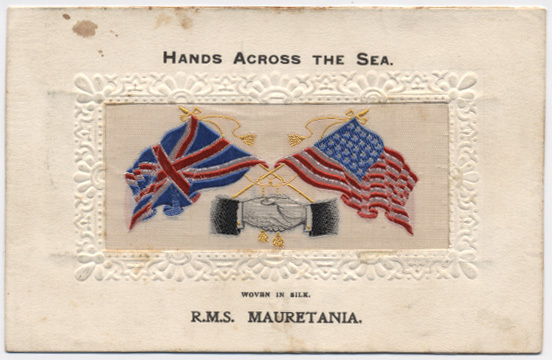 The other style is a ‘Hands Across the Sea’ card with national flag images depicting the countries normally served by the named ship. For example, the Lusitania card depicts British and American flags; the Empress of Ireland card pictures the British and Canadian flags. Because all these cards were relatively expensive to the sender they are uncommon and relatively expensive to the collector. Frequently they were sent in an envelope since they are relatively fragile, so postally used versions are relatively rare. Values depend upon the ship, the condition of the card, and the shipping line. As would be expected, White Star Line cards, particularly RMS Olympic, sister ship to Titanic, have an enthusiastic following. Ships in disasters are expensive because some people collect cards related to disasters. In this collection, RMS Lusitania and RMS Empress of Ireland fit solidly into that bracket. What do these cards tell us? First, that the British textile industry in the later 1800s was creative and adaptive. Second, that postcard manufacturers were always searching for new types of product and found one in specialized shipping images purchased in bulk and then mounted into postcards. Third, that buyers will pay more for what is perceived as a quality product. These charming postcards are contained in The Sayers Collection in the John Johnson Collection at the Bodleian Library. A vast quantity of other ocean liner ephemera capturing social, shipping, historical, and commercial information in The Sayers Collection, continues to migrate across the Atlantic to the John Johnson Collection.